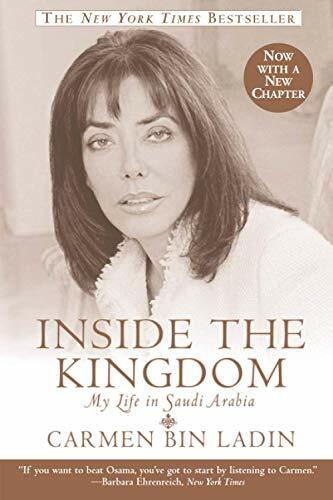 I found parts interesting but in the end, it was difficult reading about a woman complaining so much about her life in Saudi when she was shopping for $60,000 dresses, having servants and worth over 300 million dollars. Arrived today! Thank you, matlockjames! I completely understand why Carmen Bin Ladin found her life in Saudi Arabia intolerable. I can't even imagine how horrible it must have been to watch her daughters being slowly extinguished, to spend every day desperately afraid that she would lose them. To not be able to leave her house, express an opinion, even express affection or any kind of feeling, have every word and gesture absolutely controlled...Unfortunately, I think many people have a knee-jerk reaction to memoirs like this: "Well, she was rich - her life couldn't have been *that* bad." I think this book amply demonstrates that money really isn't everything; that in fact it's nothing, when it's literally all you have. I got this book from Lesehest at our meetup yesterday. Sounds like an interesting story. I found this book interesting, and I think Carmen Bin Ladin is brave to actually tell her story when she knows the powers she is up against. I can't even start to imagine what it would be like to be a woman in Saudi Arabia, where your entire identity is that you are either someones daughter, wife or mother. In my opinion, I do not think money is any help at all, Carmen was just as imprisoned as she would have been without (whilst in Jeddah). In addition, the holidays in Switzerland seemed, at first, like a pleasant break from the crude reality of Saudi-life. However, I can easily believe that in the latter years they must have been like heaven, where they had to return to hell. As I read, I did ask myself about poor people in Saudi Arabia. It is written that the women shopped to cure boredom, etc. What was life like for poor people? In particular poor women?